Earlier this year, WhatsApp launched its Snapchat Stories clone called Status, which has become quite popular over the months. The Status feature lets you upload multiple photos and videos of your whereabouts throughout the day, such that they come together to tell your story. Your Status is automatically reset after 24 hours. If anyone in your contacts has updated their Status, it becomes visible in the new Status tab. And you can tap on a particular contact’s icon to view their status. But, WhatsApp doesn’t currently allow you to download Status photos and videos directly to your phone. Even so, you might still want to download a photo or two from a friend’s status update someday. Here, we’ll explore a few tricks to download WhatsApp Status photos and videos of your friends, directly to an iPhone or Android devices. The official WhatsApp app for the iPhone doesn’t have any button to let you download someone’s WhatsApp Story. But a third party WhatsApp tweak, called WhatsApp++ has added the facility to download photos and videos, as you’re viewing other peoples’ stories. Your downloads get saved to the Camera Roll in the Photos app, so that you have no problem accessing them later. Since WhatsApp++ is an unofficial tweak, it’s not available on the App Store. And normally, you have to jailbreak your iPhone in order to install it. But because of BuildStore, you can install WhatsApp++ (and many other out-of-store apps) on your iOS device, without having to jailbreak it. All you need is a $9.99/year per device subscription to BuildStore. Note: Installing WhatsApp++ from BuildStore requires you to uninstall the original WhatsApp app. Uninstall the original WhatsApp app from your iPhone if it’s already installed. Once installed, register WhatsApp++ with a valid phone number. Open WhatsApp++, tap on the Status page and view the particular Status that you want to download media from. When the particular photo or video that you want to download, is playing, just tap on the Download button in the bottom right corner. The file will be downloaded to your Camera Roll. Note: There are other ways to install iOS apps from outside of the App Store without jailbreak, for free. But, in these cases, you usually need to reinstall the app every 7 days to keep using it. Moreover, it’s quite difficult to find a reliable, unaltered installer (IPA) for specific iOS apps on the Internet. BuildStore is a preferred solution because of its ease of use and trustworthiness. All apps and tweaks found on the BuildStore repository are updated and uploaded by their developers. On Android, whenever you View a user’s status in WhatsApp, the media files present therein get automatically downloaded to the hidden .Status folder located in WhatsApp/Media/ directory of your Internal Storage. You can manually save those files by browsing to the WhatsApp/Media/ directory using an advanced file manager like ES File Explorer, and then enable hidden files to view the .Status directory. From there, you can just copy the contents of the .Status folder and paste it in a location of your choice. If you do not want to do this manually, there are several apps available on Google Play Store that offer to let you save WhatsApp Status photos and videos. In this demonstration, we’ll use an app called Status Saver for WhatsApp. Here’s how it works. Note: It is assumed that you already have WhatsApp installed on your Android device. Download and install Status Saver, if you haven’t already done it. Open WhatsApp and navigate to the Status section. View the Status of the person, from which you want to download media files. While being viewed, WhatsApp will automatically download the containing media files in its internal hidden “.Status” folder. 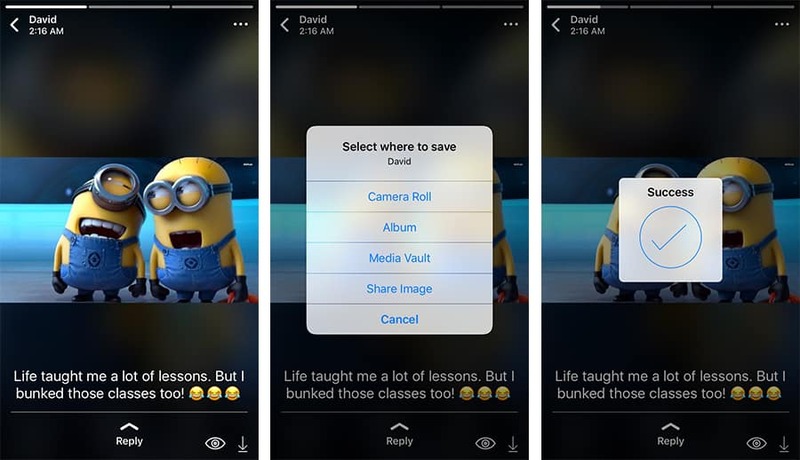 Browse the downloaded photos and videos from viewed WhatsApp Statuses, and select the ones that you want to download. The selected Status Photos & Videos will be downloaded to your Photos Gallery. If you’re using WhatsApp on your computer via WhatsApp Web, you can directly save your contacts’ status photos and videos on your computer from the web app. Open WhatsApp Web on your favorite browser. Select the particular status from which you want to download specific photos and videos. Right click on the particular photo or video that you want to save, and select the appropriate option to save the photo or video to your computer. Thus, you can download photos and videos from any WhatsApp Status on your smartphone or computer. If you know of any other apps worth mentioning here, let us know in the comments below.